Below is a short list of the unique energies of each form of Goddess Durga and her respective night of worship. Further below is a longer explanation of Durga and her various forms. Sept 20 Shailaputri– She has the energy of igniting things and beginnning new endeavors. She brings stability and power. She removes problems with government, IRS, father past karma; ensures rising in position in life. Sept 21 Brahmacharani – learning, growth, expansion of knowledge, abundance in the family. Sept 25 Katyayani – most important for marriage; improving memory, brings playfulness, associated with healing scents. Sept 26 Kalaratri – removes poverty, money problems, aches and pains in the body, sadness, grieving,and sickness. Sept 29 Vijaya Dashami – [special morning fire ceremony at approximately 10am to 2pm] brings all these energies together for success in all aspects of life. For updates about time and location look through the posts on the event page. Hindu spirituality has the foundation of a singular divinity (Brahman). One that is beyond duality (two-ness) and beyond our comprehension. The single divinity manifests through multiplicity, and it is that multiplicity that manifests existence. Duality starts when the One becomes two (god and goddess). Each form the divine duality (god and goddess) then take three pathways of manifestation through the qualities (guṇas) of creation, maintenance and destruction (rajas, tamas and sattva). The internal state of the male divinity is seen as the three states of consciousness: waking, dreaming and causal being. 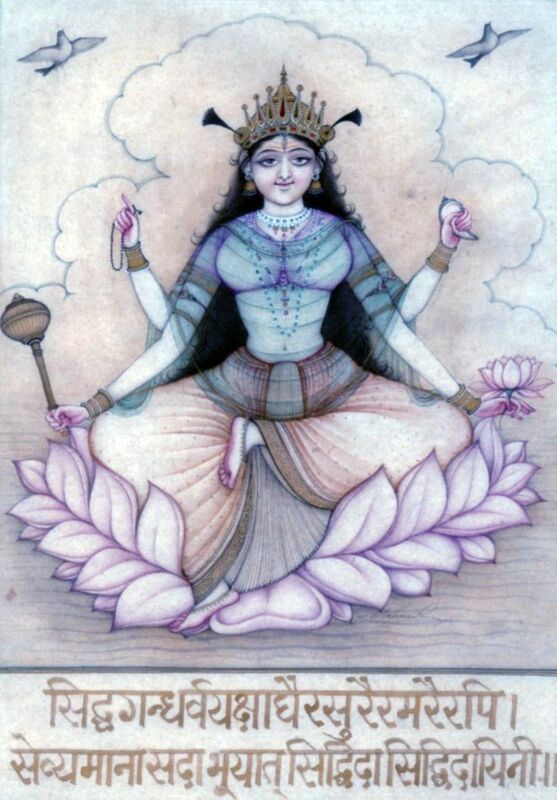 The internal form of the female divinity becomes known as Śrī śakti- the power of being, Bhū śakti- the power to create, and Kālī śakti- the power of the material world/time/change. The male forms are personified as Viśṇu, Brahmā, and Śiva, and the female divinity is personified as Lakṣmī, Sarasvatī and Kālī. The interaction of these energies is complex and creates the reality that we perceive. Durga is Śrī Śakti. She is the primary power from which all other forms manifest. 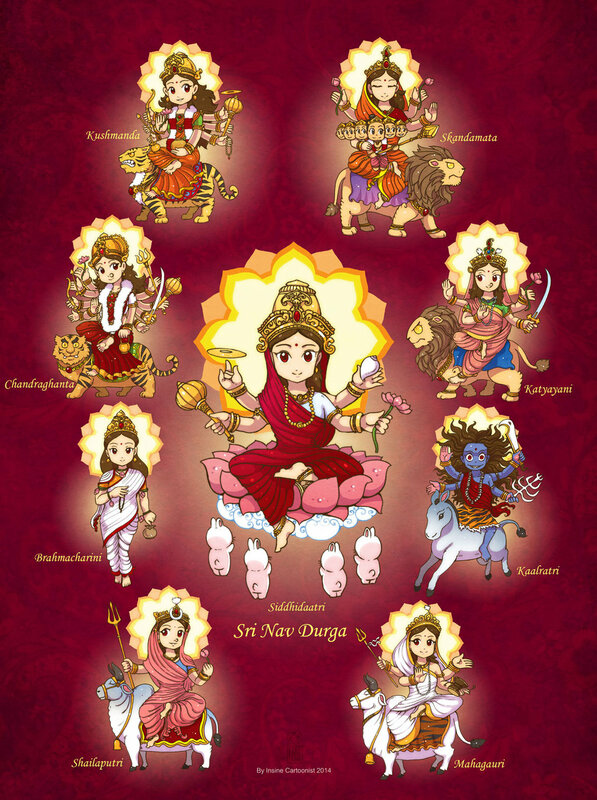 Durga has nine main forms in which she is manifested and worshiped. It’s important to not get lost in the forms. All forms are just faces of the one Mother. Once you were an infant, a toddler, a child, a teenager, and may now reside in an adult body. You are a single person yet resided in all these qualitatively different states. In the same way the divine energy manifests in different states, and we call these different states by different names. This multiplicity is both external and internal. In our personality, there are different natures. When we are with young children, a gentle personality comes out. When we are with rough aggressive people, a tough natured personality comes out. When we are frustrated, our short-tempered personality comes out. There is an artist, a cynic, an inner child, a lover, a spiritual devotee, and more that all live within our single being. These different aspects of our own self are reflections of how the energy of the one becomes many. By honouring the core nine archetypes of the Divine Mother, we honour the core causal aspects of creation, the core mental archetypes within our mind and the core energies that we see in the world. These forms can be associated with the nine Vedic planets but they are not governed by the planets. These forms of the Mother are the supreme powers of the universe who are the energy behind all planets. 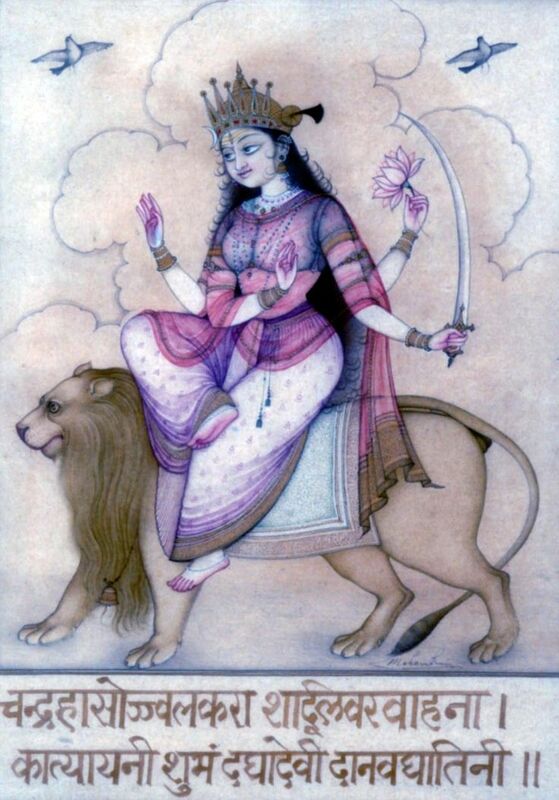 Durga is the power of Brahmā, Viṣṇu and Śiva, everything comes from her. Honouring her is honouring our feminine creative source; the source of who we are. The first form, Śailaputrī, is representative of the singularity of the goddess; the face focusing on the oneness. She resembles the Supreme Mother in essence. 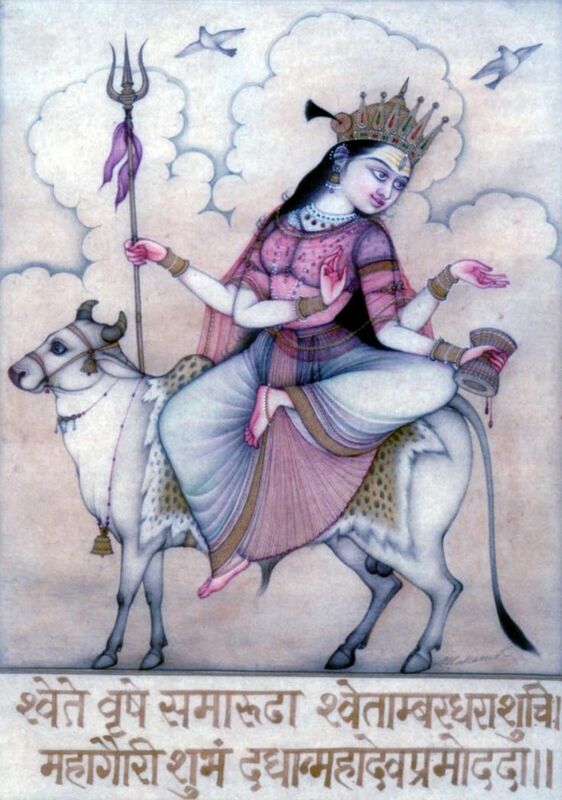 She rides upon a bull holding a trident in the right hand [and often shown with a lotus in the left], the half-moon (ardha-chandra) is like crown on her forehead. She is known as the daughter of the mountains (parvatī)- a rugged mountain woman. One of her names is Gauri, which means white, shining, and brilliant like the snow-caps of the mountains. This from of the mother is purifying, and specifically brings ‘clarity’. She is the authority among the mother goddesses, and sustains the cycles, routines and natural order. She has the energy of igniting things and beginning new endeavours. She brings stability, power, and self-confidence. She removes problems with government, IRS, past father karma, and ensures a rising in position in life. 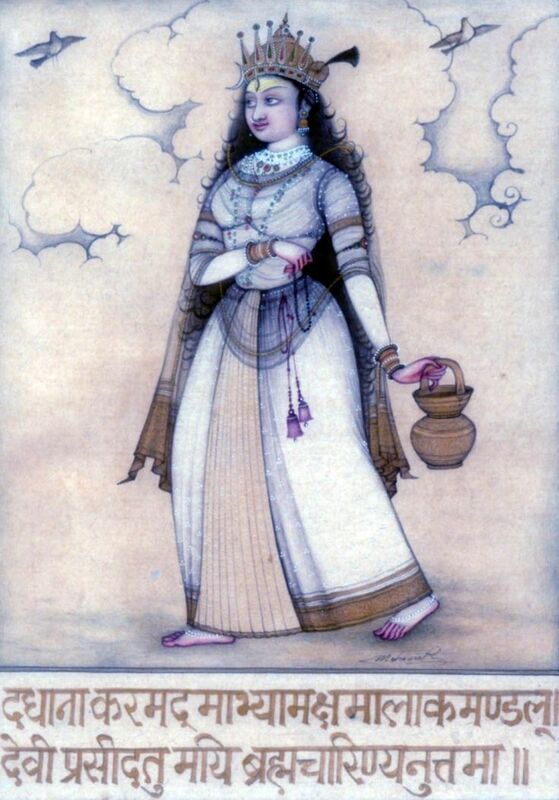 She holds a rosary (akṣamālā) and sacred water vessel (kamaṇḍalu) in her gentle hands (lotus like hands). She is unsurpassed in what she can accomplish. She is visualized as a celibate female practioner who performs penances (tapasya). Brahman is the supreme divinity, and cārin is to move, to walk, to act or practice. A brahmacārin is one who is focusing their mind on the Supreme, taking actions with the Supreme One in their mind. A brahmavicārin is one who is in god-consciousness. Doing all acts with the Supreme source in mind, leads to residing in the Supreme beingness. This form of the mother, represents our spiritual aspirations and the work we do to realize this aspect of our life. Above we discussed the three forms of Śakti. 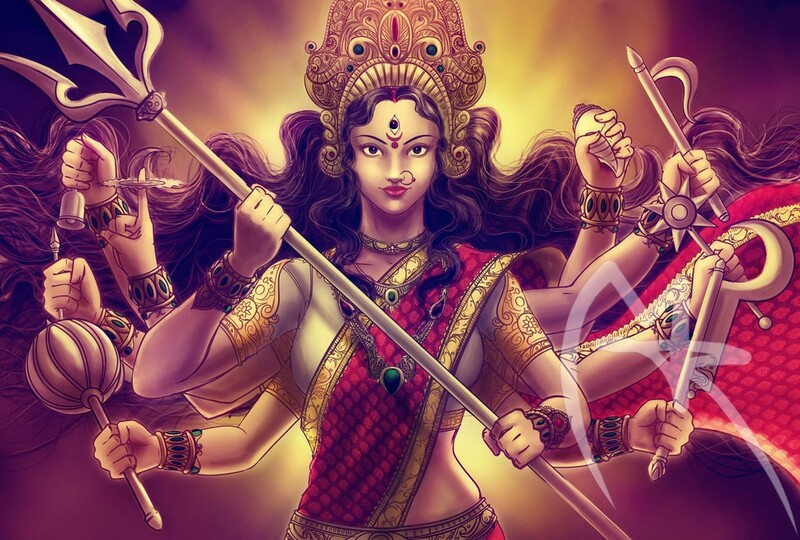 Understanding these three powers can help us to understand the nature of Durga and Her forms. Śrī śakti is the power of Being (will). The supreme source is ‘Being’, called Brahman. It just is- it’s not doing. If the not-doing does something then it is no longer just ‘Being.’ So the core eternal Being is the eternal ‘I’ (ahaṁ) at the center of everything. And the power of that Being is I-ness (ahaṁta) also called self-consciousness. Why should ‘Being’ do anything? When we meditate, and we attain the place of peaceful contentedness- we still get up to go ‘do’ something afterward. Śrī śakti is the power of self-consciousness that allows individual existence to flourish. I-ness wants. It is the seed of desire. As Śrī śakti wants, she creates She changes state from the power of being to the power of creation- Bhū śakti (or what we call Mahāsarasvatī). Śrī śakti is the root power of the will (causal body), while Bhū śakti is the power to create (subtle/dream body). Kālī śakti is the power of action which manifests the physical realm. Here I get to the main point, of which was not possible to fully understand without the above philosophy. 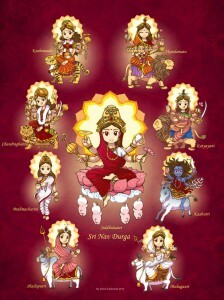 There are ten forms of Kālī (Daśa-mahāvidyā), and there are nine forms of Durga (Śrī śakti). Understanding their difference will enlighten our understanding of each. 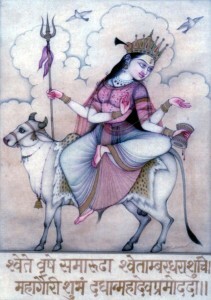 Kālī śakti is manifesting the material world- she is dense. She is known as the force of veiling the soul, covering us in darkness to be lost in the material play of existence, sometimes called avidyā-ignorance. Her dark forms of the mother are destructive (tamas), and break reality, cleanse us, and remove ignorance. We walk the wrong paths in life because of a lack of true knowledge. These forms of the mother goddess remove the veils to this knowledge and rip away everything in the way. 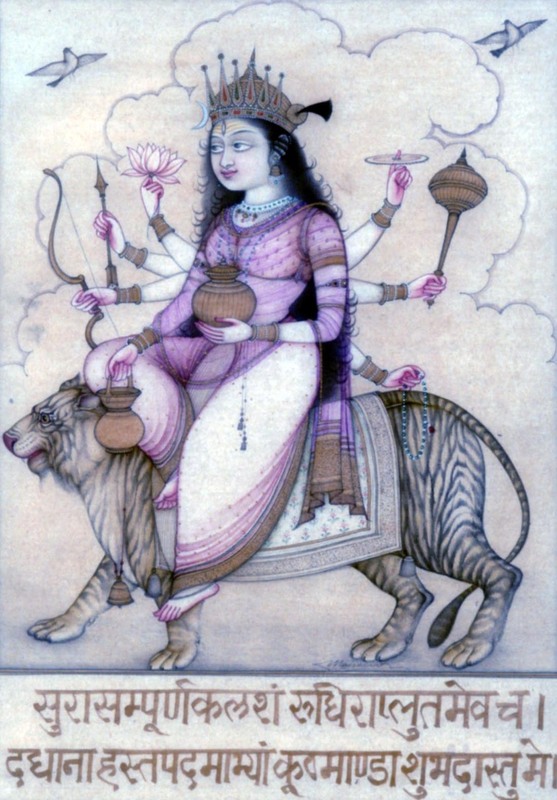 The forms of Durga (Śrī śakti) are not destructive, they are supportive. They nourish and support growth. They instil in us the healthy desire which thereby gives us the vision to take the correct path. We see images of Durga destroying the demons of ignorance, but her wrath is force of understanding. Her spear in the demon of the ego (ahaṅkāra) is the focus on the deeper truth of our existence. When we look at the correlation between the different archetypal forms we can see the difference between the two aspects of śakti in our internal world. The Hindu goddess Tārā (Mahāvidyā) destroys our lack of commitment, our lack of faith, she burns untruth, and destroys the internal and external enemies to our advancement. Brahmacāriṇī supports the same principle. She cultivates daily practice, daily purification (śodhana), and the spiritual drive to achieve succcess. She brings good association into our life, increasing learning, knowledge, growth, and abundance within our family. 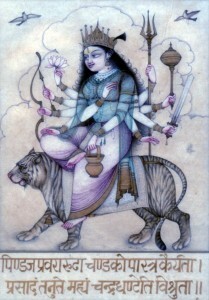 The primary form of Durga with Her many arms has all these forms within her. Bhū śakti and Kālī śakti as well as the auspicious nine forms are Her manifestations- they have manifested from Her, through Her, by Her will. The many arms and weapons she carries is representative of the fact that all these forms reside within Her. Chandraghaṇṭa is riding on a lion, with a violent and angry attitude and carrying all sorts of weapons. We pray to her for clarity-brightness and ask for her favour (prasāda). Her name means the Moon (chandra) Bell (ghaṇṭa), and there are many theories for this name. One is that she has a half-moon the shape of a bell on her forehead. Another is that she is the wake-up call/bell for the mind. Another is that she is the bell of time, like the church bell struck every hour- ticking away time (consciousness unfolding). The Moon also represents the mind and the bell may represent the inner sound (nāda) calling the mind back to its source. Chandraghaṇṭa is the Moon-bell, or the bell of the Moon. In the Devī Māhātmya, the bell was given to the manifest form of Durga by Indra from his elephant Airavata (2.22). In the battle against the demons of Egomania (Mahiśaṣāsura), the goddess uses her bell to bewilder (vimohitā) the demons with its resounding ring (2.56). These demons represent the negative attributes of the mind, and the bell is that which stops these negative thoughts in their tracks. If one is meditating and a continuous thought continues to bother the mind, the ringing of a bell will help clear the mind and clear a fresh space. When pūjā begins or ends, or when you walk into a temple, a bell is rung to clear the space of both the inner and outer. The sound of the bell is a tool for the peace of the mind and the peace of a location. While preparing for battle, Durga’s lion roars and she magnifies the load roar with the clanging of her bell (8.9). And in battle, she fills the directions with the ringing of her bell, which vanquishes the foundation of the strength (tejas) of the demons (9.20). Tejas is not an easy word to translate, but can mean strength, vital energy, brilliance as well as the fire of cognition. When we call someone brilliant, we are referring to their tejas. On an external interpretation, the bell destroys the demon energies, chases away ghosts and bad energy. Daitya is a term translated as demon, but literally means ‘those born of Diti.’ There is a Vedic story of two sisters, Diti and Aditi. Diti, meaning difference, gave birth to all the demons. Aditi, meaning no-difference, gave birth to the Vedic gods. Those born of Diti, are those born of dualistic thinking, that sees difference, have prejudice, lack empathy and don’t follow the golden rule; these are the demons within us. On an internal interpretation, the bell (nāda) removes the energy of the negative thoughts, or on an even deeper level, removes the dualistic thought (daitya-tejas). Protect us with the sound of your bell and the twang of your bow. Oh Goddess, protect us like a mother her children. We ask for auspiciousness from She who has a full pot (kalaśa) overflowing with blood red wine (surā) in her lotus like hands. Sura means light and divinity, sura is what makes the gods of the light, asura means not-light and this is what makes them ‘demons’ or we could say those who are not-light. Surā means that which is distilled; when the esence has been extracted out. It represents the extraction of the essence of things- the wine of our essential nature, or the wine of divine love (essential love) as Rumi used to speak of it. The wine is blood red representing the essence of our life energy. Kūṣmāṇḍā is said to sit upon a lion and have eight arms- holding a jar of nectar (wine), sacred water pot (kamandula), bow, arrow, chakra, mace, lotus and rosary. She is also called ‘Aṣṭabhuja’- the eight armed one. 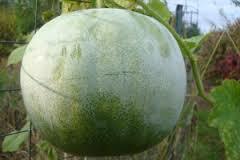 Kūṣmāṇḍa is a type of pumkin-gourd (Benincasa Cerifera) which is eaten in the autumn to protect the health from the changing seasons. The Devi Purāṇa breaks the meaning of her name as little (ku) warm (uṣma) egg (aṇḍa). In the Hindu stories of creation (from the āgamas), there are three levels of creation based on the creation of the causal realm, the creation of the mental realm and the creation of the physical realm. Westen thinking often believes that there was matter (elements and compounds) that came together to start life which evolved slowly into feeling, thinking and developed consciousness. The Hindu understanding begins with conciousness, which separates into individualities. Then the mental/dream realm is generated in which the individual entities interact within. Then the physical realm is created in which souls manifest and experiene the fruits of their actions. Therefore consciousness is inherent in everything, not because it evolved a mind to think- but because it is made from the matter of consciousness. At the end of the Devī Māhātmya there are three additional chapters called the Rahasya (the secret), which is a deeper and more complex Śakta philosophy (that I will do my best to simplify). The first Rahasya, is an anthorpomorphic description of the creation of the causal realm (pradhāna). The Rahasya says that the Supreme Mother (Parameśvarī) is known as Mahālakṣmī and has three modes (triguṇa), both manifest and unmanifest (v.4). It is these three śakti of the Mother that give birth to the three guṇas of rajas, tamas and sattva. The Goddess of Sound (Sarasvatī) and Brahmā then generated the primordial egg (aṇḍa) containing all the structures and elements of creation. Rudra and Gauri broke the egg open, and Viṣṇu and Lakṣmī sustained the manifesting world (v.27-29). This abbreviated story of creation is found in many different Hindu sacred texts and it is filled with deep meaning about the functioning of consciousness which is reflected in the manifestation of the world. Śrī śakti manifests and unfolds and generates an egg and the world through it. She is not just everywhere she IS everything that is anywhere. The power of generating (creating the egg-aṇḍa) is seen in the form of Kūṣmāṇḍā. 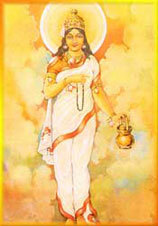 She is Jagatprasūtye- she who gives birth to the world. In this way, Kūṣmāṇḍā is associated with conceiving, pregnancy and birth. She is a creative energy that can generate abundance, happiness, and love. She is represented by the nourishing pumpkin-gourd and is a goddess associated with increasing ojas- strengthening the immune system, slowing aging and increasing longevity. 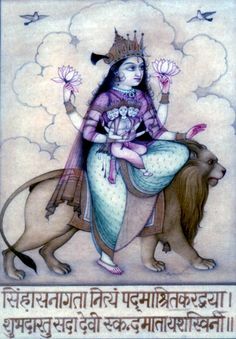 Eternally the illustrious Skandamata moves about on a lion, holding lotuses in her hands granting auspiciousness. She is shown with the the god of war, Skanda, on her lap as a little child. The most dangerous deity in the universe- anger, strength, tactical knowledge, destruction, war. This energy is just a child in her lap. She represents the energy of self-restraint and discipline, as a warrior’s strict and rigorous life. A warrior knows how to utilize anger for positive results. In the Devī Māhātmya, the Goddess is battling the demon king’s generals who have names like Disbelief, Anxiety, Blindness, Violent Temper, Passion, Irresistable Temptation, and Foul Mouth. The Goddess became so angry with them, the anger condensed on her forehead. Through this condensed anger manifested the frightening form of Kālī. This form then became enraged on the battlefield devouring demons. 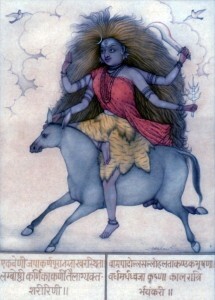 On completion of killing the generals Chaṇḍa and Muṇḍa she was given the name Chamūṇḍā. This form represents the intensity of rage in the form of the dark Goddess. These energies are pacified and cleansed from us by the invocation of the wrathful goddess. There are two famous mantras of this fierce Goddess: the Navārṇa mantra and the Caṇḍī mantra. The Caṇḍī mantra is associated with Caṇḍa and the Navārṇa mantra with Muṇḍa. Caṇḍa and Muṇḍa are the two demons that the terrible form of Durgā destroys. Oh Triple Goddess, Remover of the dual fluctuations of the mind, cut away ignorance. Auṁ praises to the fierce Goddess [who can remove the negative]. Skandamata is the form of the Mother with the potential for intense violent frenzy, in a calm restrained state. She contains both extremes and peace and aggressive fighting. A martial artist trains to be able to defend or defeat any opponent, but they don’t go around fighting. They use their strength and skill wisely. Skandamata upholds herself with complete self-control. This form of the Mother removes aggressive tendencies, fighting, problems with the police and also issues with rashes and skin disorders. She is the Mother of the god of war, who is a baby on her lap. I offer praises to you. Kātyāyaṇī is listed as a synonym for Parvati in the Amarkoṣa (an ancient Sanskrit Thesaurus). This name is also used interchangably with Durgā. The specific form of Kātyāyaṇī improves memory and sharpens the intellect by making the thinking clear. Kātyāyaṇī particularly helps us to overcome shame. This was seen by the gopis who had their clothing stolen by Kṛṣṇa, and then had to reveal themselves and overcome the shadow of shame. Kātyāyaṇī removes the hindrances to the inner child, and allows us to find humour in our life so that we act young and playful. She is associated with healing scents and blesses people with finding their marriage partner. Kālarātri is black and naked except for her ear-ornaments on her large ears. 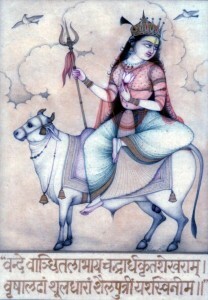 Her lips hang open (lamba-oṣṭhī), her body is covered in oil, and she sits on a donkey. She has a single braid [of mourning] in her hair. We pray for her to destroy the darkeness in our minds. She holds an iron scimitar in her upper left hand and a lightening bolt in her lower left hand. Her other hands are granting blessings and protection. Rātri means night. Kāla means time, death, black or dark. It is the unfolding of time: the time on the clock that keeps moving forward, making us older, leading us to our death (hence it also means death- your time has come). It is a heavy crushing energy that makes even the greatest nations fall one day. Kālarātri could be translated as Dark-night goddess, or Death-night goddess. Death is similar to sleep, you let go from your body and enter the dark realm where you have no body but just the thought forms within you. Fear is all relative to the thought forms we have in our mind and how we relate to them. There are many small fears, but the fear of death is one of the largest, most frightful of them all. Kālarātri is also the night- the dark unknown that allows our mind to fill itself with fears. She can be the acceptance of fears, as they are. You can have a fear of something and know that it is there and not have to run our life. Kālarātri represents our shadow nature. In the Mahābhārata (Karṇa Parva 8.34), each part of Śiva is described as it is composed of the various gods and goddesses. Śiva’s bow is made of the cycle of the year and decorated by the seasons. And Rudra’s own shadow which is the Kālarātri is the indestructable string of his bow. She is symbolically god’s shadow- the darker side of life, the darker power of being. This intense dark energy lives in all humans, everyone has a shadow nature, it is a power that is part of who we are. To avoid looking at this darkness is to give it power over you. To take the appropriate time to look deeply at yourself, acknowledge these darker forces of consciousness pacifies these forces. This is why Kālarātri is worshipped, not to bring darkness, but to acknowledge it so that we can be at peace with it. Carl Jung talked about how we bring more light into ourselves not by going only towards the light, but by bringing light to our darkness. Kālarātri is the destructive part of who we are. In the Mahābhārata (Śalya Parvan 9.11), Bhīma on the battlefield, infuriated with rage,with his mace (resembling the bludgeon of death) is compared to Kālaratri, exceedingly destructive, fierce as a she-snake, hard as thunder, smeared with marrow, fat and blood. Resembling the tongue of the God of Death, producing shrill sounds like the thunder of the King of Heaven. Kālarātri is the heavy, dark, painful, suffering force that exists in the universe. Worshipping her pacifies this energy; it removes poverty, sadness, grieving and sickness. We all have tough times in our life. It is the tough times that build our character, that make us appreciate all we have. Those who haven’t had times of suffering, live in a fluffy superficial level less in touch with the deeper nature of the universe. We praise that form of the Mother that gives us times to make us more mature, to make us appreciate life more deeply, and who helps us to come out stronger on the other side of any ordeal. 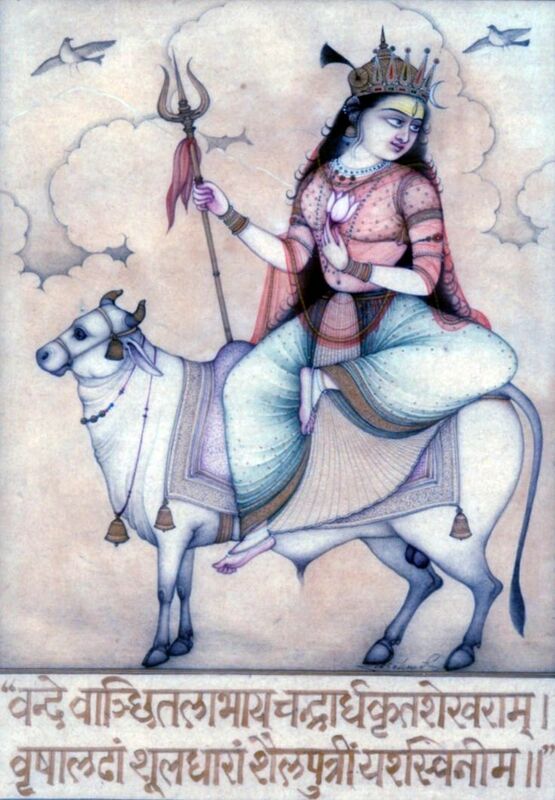 Mahāgaurī is brilliant and shining, clad in white clothe and riding on a white bull. She is the delight of Mahādeva and gives the blessing of fortune (śubhaṁ). She has four arms: holds a trident, a damaru (double-drum), and offers the mudra of blessings and fearlessness. The Supreme Power can be aproached in different forms. The term Brahman, which indicates this source in the Vedic path, is a neuter word. It does not have a male or female connotation, nor does it have a fixed embodiment. It is beyond any dualism or empirical understanding of the human mind. Yet, as human beings with minds, we utilize a form to direct our mind to the Supreme Being. If we approach this Supreme Source as a father, we take a certain state of mind, which is very different than if we approach it as a mother. Our approach/ conception/ imagining (bhāvana) creates a state of mind (bhāva) within us. The form does not change the Supreme, it changes us. Those who did not have a father, or the father figure was not a positive influence in their life, will benefit from worshiping the Source of Being as a Father. It is a way to heal oneself of the missing energy that was not present. Those who have had negative experiences with their mother growing up, can approach the Divine Mother for healing those aspects of their self, particularly where bonding did not happen securely. She can remove the karma that is passed from generation to generation and create a healthy way of relating (to one’s own emotions as well as those of others). To worship the Supreme Source as Mother is to humble ourself. We enter the state of the child. Our thoughts become gentle and pure. In this state the healing and nurturing energies of the universe become available to us. The most simple mantra for worship of the Divine Mother is Auṁ Mataye Namaḥ which means Auṁ praises to the Mother. One can also chant Auṁ namaḥ Śivāye, which is the feminine for of Śiva (Śivā) representing the goddess. Or in whatever way one approaches the Divine Mother, be aware of the pure state of the child who comes to the mother for care. 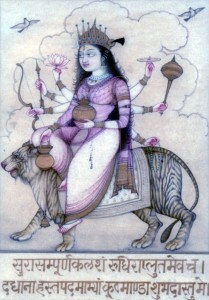 Mahāgaurī is the form of Durga as the benficient mother. She brings luster, happiness within the family, closeness in the community, and pure thinking. She is abundant and associated with giving the comforts of life. She has the nurturing and healing powers of a mother and is assocaited with herbal medicine and healing foods. As a mother cares for her child, it is said that Mahāgaurī is the form that fulfills our desires. May Siddhidāyinī (the giver of perfection) who is always served by masters (siddhas), celestial musicians (gandharvas) tree spirits (yakṣas) demons and gods, grant us with perfection in all we do. Siddhidātri is four armed, seated in a lotus. She is holding a lotus, conch shell, discus and a mace. Siddhi means accomplishment, fulfilment, complete attainment, and success. It relates to the successful achieving ones goal. It also can mean readiness or maturity- having attaining the right age or the right mindset. Siddhi is also said to be the attainment of unuasual capacities, often associated with eight supernatural powers, but not limited to them. When we have completely attained something, we transcend it. Mastery of an art becomes super-natural or beyond natural (the world where everything is filled with faults). There is a four syllable mantra often associated with Gaṇeśa which is also associated with Siddhidātri, which means ‘may there be siddhi’ (or ‘may there be fulfillment’). Siddhidātri is associated with supernatural powers, psychic powers, and intuion. 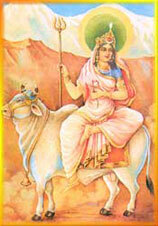 She is associated with spirituality which is the final attainment when other aspects of life are accomplished. She represents the burning of past karmas and the ability to move forward unimpeded. In the Lakṣmī Tantra (37.1-3), there is a discussion about the difference between mental worship and external ceremonial ritual (pūjā). Mental impressions (vāsana) govern what our mind thinks about. There are two types of impressions. Those which are created by external factors (like advertisements and information you read) and those created by internal factors (like how you manage your feelings and the meaning you give to experience). Mental worship purifies the internal and external impressions created daily. External worship (ceremonial rituals) purifies the stock of impressions primarily caused by external factors. The purification of these mental impressions is required for a clear and focused mind, which is required to attain success in any activity. All distractions arise within the mind from left over junk in the mind field. Siddhidātri is the goddess associated with clearing these mental impressions, and allowing us to create intentional pathways in the mind to create intentional ways of being and action. The first part of the Story of the Goddess (Devi Mahatmya) calls on Mahākālī, the second part calls on Mahālakṣmī, and the third part calls on Mahāsarasvatī. Swami Shivananda of the Divine Life Society practiced a form of Navaratri where the three forms of the Divine mother are worshipped each for three days. Below is his commentary on this practice and the reasoning behind it. “Let us, therefore, examine in detail the spiritual significance of Navaratri.The central purpose of existence is to recognise your eternal identity with the supreme Spirit. It is to grow into the image of the Divine. The supreme One embodies the highest perfection. It is spotless purity. To recognise your identity with That, to attain union with That, is verily to grow into the very likeness of the Divine. The aspirant, therefore, as his initial step, has to get rid of all the countless impurities, and the demoniacal elements that have come to cling to him in his embodied state. Then he has to acquire lofty virtues and auspicious, divine qualities. Thus purified, knowledge flashes upon him like the brilliant rays of the sun upon the crystal waters of a perfectly calm lake. These three states of conscious are aspects of the Puruṣa that generate the three guṇas. Elephants wore bells around their necks as we see in 7.10 where the goddess swallows the warriors, their chariots, and elephants with their bells. Therefore, Indra gave her the bell of the mightiest and most royal King of Elephants, Airavata. Indra represents the controller of mind with its senses, and Airavata is the vehicle of this controller. Māṇḍūkya Upaniṣad, v.4 calls the processing of the mind as Tejas. This name is a combination of Chaṇḍa with Muṇḍa, and doesn’t have a literal meaning.